Posted by Brian Enright on Thursday, January 17th, 2019 at 2:18pm. Charlotte has something to offer anyone who's looking for true live-work-play areas. Here's where to buy to take advantage of the contemporary, urban lifestyle that the most walkable Charlotte neighborhoods have to offer. Dilworth Walk: At 1829 & 1903 Kenilworth, this secure, mid-rise development is right around the corner from the neighborhood's main restaurant and nightlife area. 1315 East: These modern, full-amenity condos are in the same area as Dilworth Walk, with prime access to shopping, essentials and the great bar and restaurant scene. Charlotte is a world-class city with a central district that will live up to all of your expectations. Uptown has a bustling atmosphere complete with sports, theaters, restaurants and nightlife. There are also plenty of opportunities for you to simply walk around and explore with friends and family. The Avenue: When details matter, the condos at 210 Church are where you should look, with cutting-edge kitchen and bath appointments, floor-to-ceiling windows and private balconies. TradeMark: Units at TradeMark all get access to extensive perks, including a pool and a bird's-eye view of Panthers Stadium. 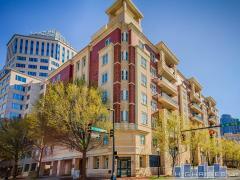 The Ratcliffe: 435 Tryon Street is one of Uptown's best addresses, and the homes here epitomize luxury urban living. Chic dining, park-view units and direct access to the Overstreet Mall: The Ratcliffe has it all. This is just a sample of the Charlotte condos with the best access to walkable shops, parks, restaurants and everyday essentials. For more, check out the full city condo directory today.